You enter a dim and shadowy room. Sitting before you is a wizened fortune teller, staring deeply into the mysterious glowing orb before her. As her hands hover over the crystal ball, she notices your skeptical frown. So, in order to validate her mystical powers, the stranger begins reciting facts about you: your name, where you’re from, where you went to college, which restaurant you ate at last week. “What is this sorcery?” you cry, your face growing pale. She pauses, smirks, and turns around her orb for you to see within. Turns out it’s merely a computer display, with your personal online data aggregated and readily available. The fortune teller reaches up and pulls off her mask to reveal… she’s an advertiser! And suddenly she’s pitching you on accounting software! For B2B marketers and customers alike, data privacy is a hot-button issue that won’t be going away anytime soon, with only 17% of consumers believing their personal information is “very secure” online. Here’s a rundown of what you need to know, both now and as you look ahead to your future. We all know that when we use the internet, our activities and information are often recorded and stored. But data privacy governs the way this info is collected, shared, and used. There has always been a contingent of the population with concerns around online data privacy (my mom refused to enter her credit card information on the internet for a good 10 years), but now these concerns are becoming more rampant and pervasive amidst prominent news headlines and frustrating first-hand experiences. Data privacy is now a part of our societal consciousness. Every business must account for it — especially as trust becomes an increasingly essential factor and regulations begin to clamp down. We’re coming up on the one-year anniversary of the General Data Protection Regulation (GDPR) being implemented in the European Union. The sweeping new data privacy law showed its teeth in January when a $57 million fine was levied upon Google for disclosure violations. Essentially, GDPR comes down being clear about how you’re collecting and using data, and gaining explicit consent to do so — which is especially applicable to marketers as we strive to be more data and insight driven to create personalized experiences. Companies that operate in the EU have already been forced to reexamine their data privacy practices to ensure they’re aligned with the new guidelines. And across the world, proactive business leaders are showing support for the initiative, recognizing without the need for a crystal ball that this path represents the way of the future. We seem to be heading that way. There are already regulations in place governing commercial communications, such as CASL in Canada and CAN-SPAM in the U.S., but it seems inevitable these will eventually give way to broader data privacy laws. As a result, brands everywhere should take a hard look at their own customer data practices, not just because of these looming legal implications but even more so because it’s plain-old good business. In fact, a study by SAP found that 79% of consumers will ditch a brand if they learn their personal data is being used without their knowledge. In discussions of data privacy, there’s almost always a focus on the consumer impact, which can make it seem like more of a B2C issue on the surface. But of course, business buyers are people too, and when brand assets are at play, the scrutiny around data protection can be heightened. Here are some things to keep in mind as you contemplate data privacy and how it relates to your B2B marketing strategy. The tricky thing is that while we can all understand the reservations people have about their data being leveraged for marketing purposes, we also know that customers (whether B2B or B2C) want personalization. And the only way we can really deliver on that is by leveraging data for marketing purposes. Therefore, it’s all about transparency. Whenever possible, be up-front and clear about when you’re collecting data, and why. Clarity is key: don’t bury them in small-print legalese. When polled by DemandBase last year, 80% of B2B marketers expressed some level of concern that their marketing technology vendors could expose them to risk for running afoul of GDPR guidelines. This speaks to another potential hazard: people will hold our brands accountable if they have a bad experience with us, even if we’re not the ones who ran afoul. It’s smart to be rigorous in vetting the data privacy practices of other businesses you partner with, especially if they influence customer touch points. Have you ever downloaded an app and had it ask permission to access information on your phone for no obvious reason? “Why is this calculator asking to get into my contacts?” That kinda thing immediately sets off alarms. Quality over quantity. Be judicious in the data you seek to acquire and make the most of it. Will.i.am is a musician, not a fortune-teller, but he still laid out a compelling vision for the future in a piece he wrote for The Economist recently. Why wait until tomorrow? B2B marketers would be wise to adopt this mindset now. I’ve argued before that data-driven marketing can play a major role in restoring the trust that has diminished amidst high-profile corporate breaches and fraud. Be virtuous in your approach. Honor as sacred the personal information of those you serve. Gather consent but understand that you don’t own the data; you’re only borrowing it to be helpful. This is a new world and we’re all figuring it out together. There are no magical solutions. But the first and most important step to a strong data privacy program is to be thoughtful and purposeful about how customer data factors at every level of your B2B marketing operation. Hungry for more insights on this topic? Check out my recent post to learn about the state of trust in marketing, how we got here, and where we’re heading. 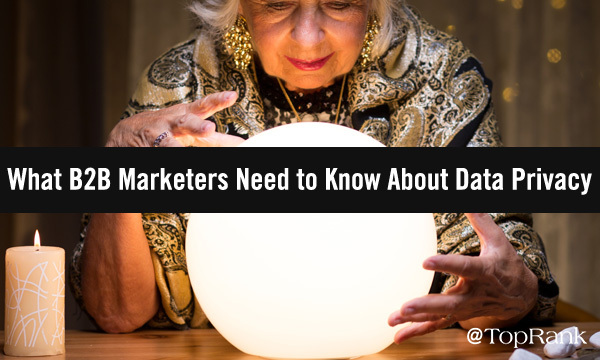 The post What B2B Marketers Need to Know About Data Privacy Today appeared first on Online Marketing Blog – TopRank®.